After many years of perfecting our range of 4wd steel wheels Huntsman Products introduces exclusively the “THUNDER 4x4 STEEL WHEEL RANGE!”..
With a more than impressive finish the major factor of the Thunder wheel is its quality of balance and run out. 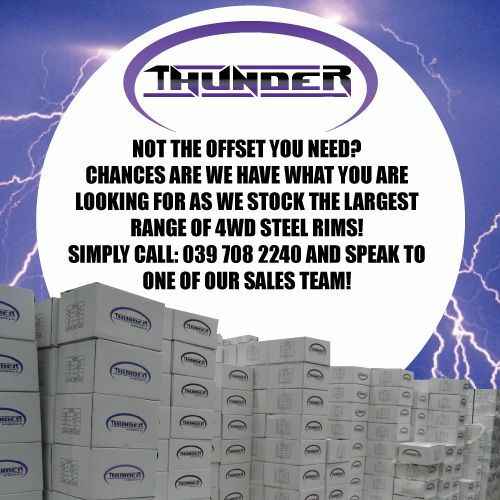 The THUNDER WHEEL ticks all the boxes which includes: Outstanding stability, reliability, strength/thickness and is also the perfect look to finish off your vehicle. No stone has been left unturned in the manufacturing process of these rims. The “THUNDER RANGE” is the new face of the 4x4 market, offering the same quality as the major players just without the major price tag! !